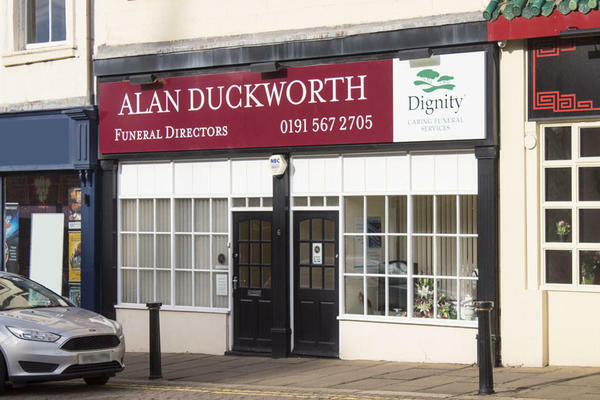 Alan Duckworth Funeral Directors in Sunderland City Centre are here to support you through a difficult time. We believe that a funeral service should be a unique and personal chance to say farewell to your loved one, and we are here to help you plan a bespoke ceremony that helps you to do just that. Located in the city centre, we are easily accessible from the surrounding areas. We also have a sister funeral home nearby, on Chester Road. Our funeral home is equipped with six private chapels of rest, and you can use these to spend time alone with your loved one before their funeral. We have designed and decorated our funeral home with your comfort and wellbeing in mind, to help you feel at ease whenever you visit us. We want to help you arrange a meaningful celebration of life for your loved one, supporting you at every step of the way. We will take care of the arrangements on you behalf, to make things a little bit easier for you and your family. You can reach us whenever you need us. Our telephone line is open 24 hours a day, so we are always available when you need our support, advice or guidance. Call us today on 0191 567 2705 to talk through your personal requirements. We only have disabled parking at our funeral home. We are part of the Sunderland Empire Theatre's building. Our staff are available 24 hours a day on 0191 567 2705 if you require our services outside of these hours. From first contact your company looked after us as a family at a very difficult time. Can’t thank you enough for your care and for looking after Dad so well.